Here is my final magazine. 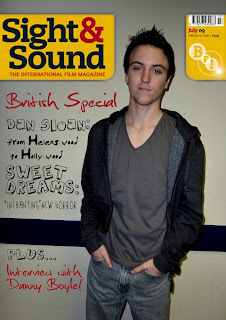 I decided to feature Dan as the director of my film on the cover, inspired by the magazine that I analysed. I used five different typefaces because it is something an actual 'Sight and Sound' magazine would have. The image is featured and stands out against the plain background. Dan looks casual and friendly and he is looking straight into the camera, which I think is effective because it makes the reader want to know more about him. I used a colour scheme of red and black/grey colours. I think this is effective because relates to the film genre, horror. I like the burst of colour (the red) because it makes the writing stand out more and the fact that it is used throughout the cover, ties the image nicely together. I tried to make the text on the cover interesting and intrigueing, to make the reader want to buy the magazine to read the stories inside.